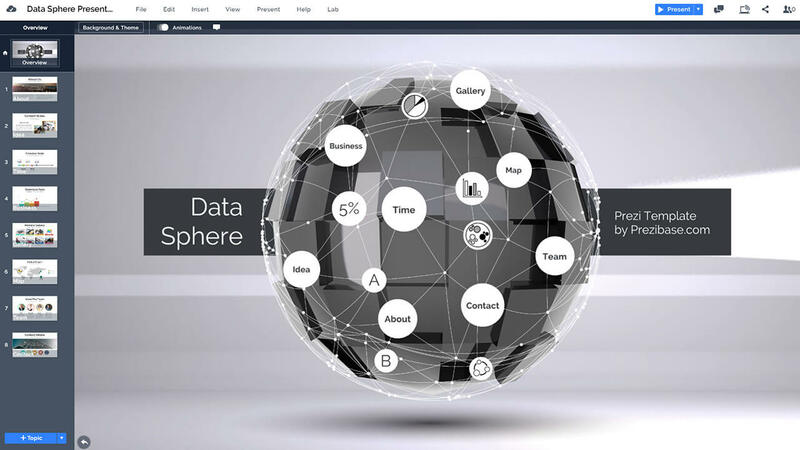 An abstract prezi next presentation template with a black sphere and white network overlay. A multipurpose template suitable for various topics including technology, data and IT. Zoom into the circles and insert your own data, build a network with your idea. Replace the example numbers and icons with content more suitable for your presentation topic. Talk about data visualization, big data, networks, internet, cyber security or IOT. Having a hard time illustrating an abstract topic like data analysis, big data or technology? 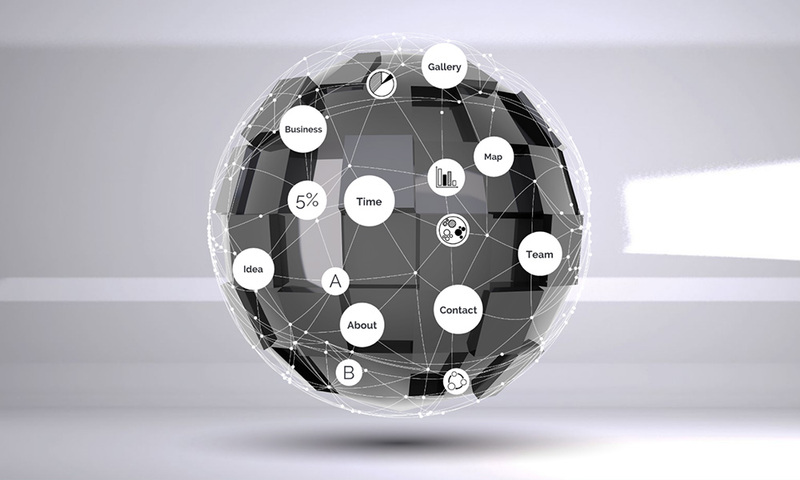 Why not use this 3D presentation template featuring an abstract black sphere covered with a network mesh. Zoom into the topic circles and present your content. Illustrate the network points with your own titles, images or icons. Technology is a wonderful thing and it connects the entire planet. This is a perfect template for illustrating the network connectivity and data connection points around the globe. A multipurpose template can be used for various IT and technology related presentation, why not even a startup tech company pitch. PowerPoint PPT template of the Data and technology sphere template is included in addition to the Prezi version. 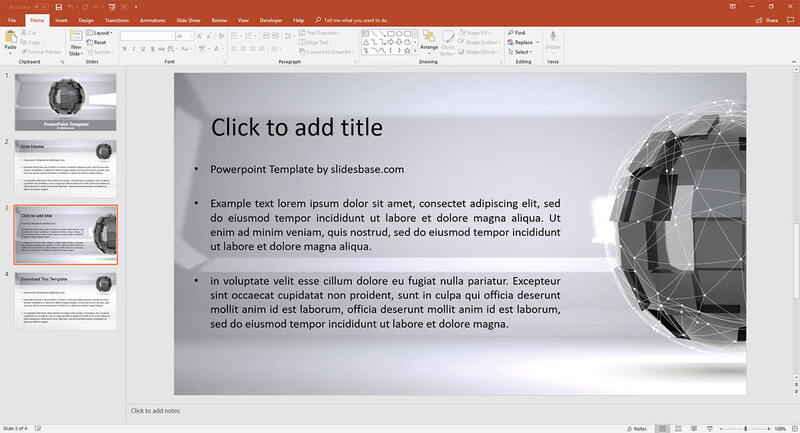 The PowerPoint template includes 2 alternative slide layouts with light and darker backgrounds. Great for situations where a Prezi is not supported but you still want to enjoy the 3D design and the network sphere graphic. This entry was posted in Best Prezi presentation templates, Prezi Next Templates and tagged 3d, 3d data sphere template, 3d sphere presentation, ball, big data presentation template, big data template, circle, creative 3d data sphere, creative sphere, data, data circle template presentation, data sphere, data sphere visualize, digital topic presentation template, globe, infographic sphere, network, numbers, ppt 3d data sphere, prezi 3d sphere presentation, sphere network presentation, technology.